JHS U-14 Cricket Team stood as champions in the KSCA B.T Ramaiah Shield Tournament. JHS is happy to announce that U-14 Cricket Team stood as champions in the KSCA B.T Ramaiah shield tournament played against Vivekananda School on 25 January 2019 at RSI Ground. 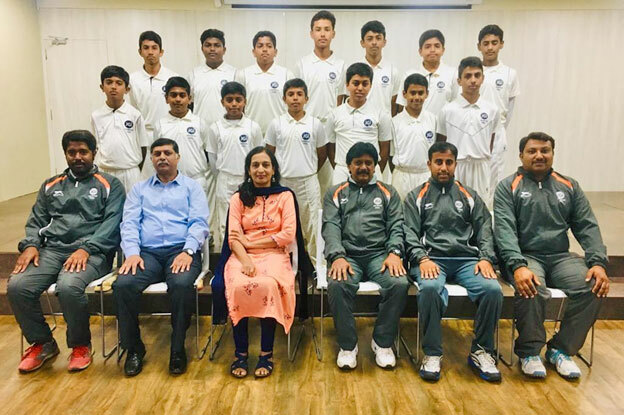 JHS U-14 Cricket team won the knock out match in the BTR shield tournament played against Florence Public School on 18 January 2019 at MVIT Ground Yelahanka. FPS scored 225 for 4 in 50 overs and from JHS Meeth and Akshay took 2 wickets. In reply JHS scored 226 in 42 overs. Aditya KS scored 105 not out, Sagar 33 and Adoksh scored 22. JHS were selected to play Quarter finals against Head Start Education School. JHS won toss and scored 238 against Head Start Education School on 21 January 2019 at RR Nagar. Akshay 82, Yashas 80, Krithin 22. In reply JHS scored 234 all out in 49 overs. Aditya took 4 wickets, Adoksh 2 wickets and Meeth 1 wicket. JHS won by 4 runs. JHS won against Saint Francis School played on 23 January 2019 at RR Nagar. SFS elected to bat. Mahesh took 4 wickets, Sidvin 2 wickets, Aditya and Sagar took 1 wicket each. In reply JHS scored 87 in 9 overs. Aditya scored 50 and Adoksh scored 30.JHS won by 10 wickets and entered to Finals. JHS won the toss and elected to field in the final match against Vivekanada School on 25 January 2019. Vivekanada School scored 162 all out in 48 overs. Sidvin took 5 wickets, Aditya took 2 wickets, Meeth and Antariksh took 1 wicket each. In reply JHS scored 164 for 3 wickets in 38 overs. Adoksh 52, Lokaksha 30, Aditya KS 22, Krithin 22.JHS won the final match by 7 wickets and the team is promoted to the 1st Division. Sidvin was declared as man of the match.